﻿​Our popular Kids Classes & After School Guide is promoted continuously to our readers from July 2018 through March 2019 with a 24/7 website ad, weekly social media posts, inclusion in our email newsletters (sent to 13,000 local parents every week), and sharing with local Facebook groups. A full and detailed listing in the Classes & After School Guide section of our Business Directory. See Guide listing. Inclusion in the separate Guide, which is promoted in weekly newsletters, ads, and social media from August through March. See Guide. A feature article in our weekly email newsletter, if desired (additional charge). Feature article content to be supplied by the sponsor. See sample article. NEW! Spotlight posts on social media: Your organization will be individually featured in a spotlight post on our Facebook page several times during the Guide run, highlighting your program and linking to your Facebook page and detailed listing. A listing in the Kids Classes & After School Guide is $160 for the Lowell OR Acton-Concord-Bedford-Lexington edition or $240 for BOTH editions. Adding a separate feature article about your program is $50 per edition. IMPORTANT NOTE: Programs are listed in the Kids Classes & After School Guide BY ORDER OF REGISTRATION. Register early for best placement! Programs can be added to the Guide at any time. 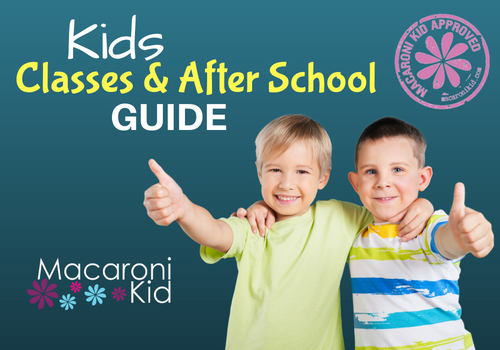 Macaroni Kid is the most popular local parent resource in this area. We are online only, where parents are. If you want to promote classes or programs to local parents, it makes sense to make our Kids Classes & After School Guide a standard part of your marketing plan! At only $160 ~ or $20 per month for the 8-month run ~ the Guide is also very affordable. (Note that the Guide is invoiced in advance and cannot be invoiced monthly.) Sign up today! ​To register for the Kids Classes & After School Guide, ​please fill out THIS FORM.